Reptiles and amphibians occupy an important place in Jill Moger's lifelong passion for natural history which has its roots in her early childhood. She has followed expeditions in books and on film of many of the world's foremost naturalists and has visited numerous zoos and private reptile collections to observe the animals at first hand. She has kept several species of "rescued" reptiles and amphibians of her own and is delighted to have watched and studied in the wild, all but one British species. Although other creatures are represented in Jill's ceramic work, it is for reptiles that she is best known. A self taught artist, Jill set up a studio at her home in York in 1981 and this coincided with her first solo exhibition at York University. Many exhibitions, commissions and Gallery representations later, Jill was elected a member of the Society of Wildlife Artists in 1999, and has variously held the posts of SWLA Council member, newsletter editor and honorary secretary. 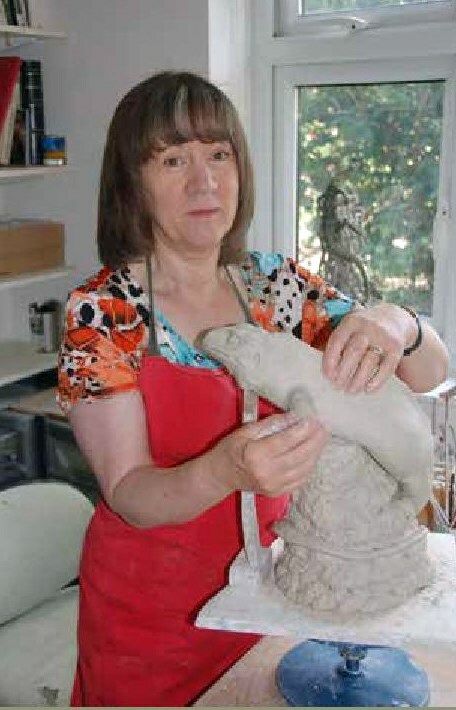 She was elected to membership of the Society of Women Artists in 2001 and won the President's and Vice Presidents Award for the best work of art in their annual exhibition at Westminster Central Hall in the same year. In 2006 she won the Anthony J Lester Art Critic Award at the SWA exhibition at the Mall Galleries. In 2009 Jill was elected a member of the Royal Society of Miniature Painters, Sculptors and Gravers and held the post of Vice President for Sculpture from 2009 to 2013. Further awards include Prize for best work in the SWLA Blake Gallery exhibition in 2007, the Bidder and Bourne Sculptors and Gravers Award in 2009 and 2012 and RMS Gold Bowl Honourable Mentions in 2009, 2011 and 2012. Jill Moger's work has been exhibited and auctioned by Bonham's in Singapore and Tennants, Leyburn, Yorkshire. She exhibits annually with the Society of Wildlife Artists and the Royal Miniature Society, all held at the Mall Galleries in London. She has also exhibited at Yorkshire Sculpture Park, Nature in Art Museum in Gloucestershire (her work is in their permanent collection), the Wildlife Art Gallery in Lavenham and the Cheng Kim Loke Gallery at Slimbridge Wildfowl and Wetlands Trust, Gloucester and the Llewellyn Alexander Gallery, South Bank, London. © Copyright Jill Moger. All Rights Reserved.